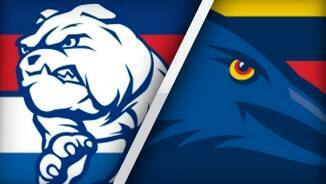 The Bulldogs have taken 21 marks from opposition kicks to the Crows' 13. Lukas Webb leads all players with five intercept marks. The Crows have gone inside 50 11 times from 17 centre bounce clearances and scored 2.1 (13) from these. The Bulldogs have gone inside 50 seven times from 13 centre bounce clearances and scored one behind. The Bulldogs have gone inside 50 10 times from 37 chains originating in their defensive 50 and scored 4.2 (26). The Crows have gone inside 50 four times from 39 chains originating in their defensive 50 and scored one goal. The Bulldogs have scored 12.11 (83) from turnovers. The Crows have scored the only two goals of the fourth quarter, both from turnovers created in their defensive midfield. Western Bulldogs InterchangeLuke Dahlhaus off due to an injury. Bulldogs InterchangeLuke Dahlhaus off due to an injury. 54.5 per cent of that quarter was played in the Bulldogs' forward half. They won disposals 12479, contested possession 37-28, uncontested possession 84-47, tackles 14-11 and inside 50s 19-13, and scored 6.5 (41) to 0.1 (1). Adelaide Crows InterchangeRory Laird off due to a concussion. Adelaide Crows InterchangeRory Laird off due to an injury. Crows InterchangeRory Laird off due to a concussion. 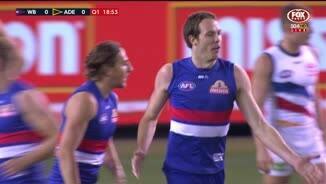 Western Bulldogs InterchangeMitch Honeychurch was substituted into the game for Jake Stringer. Jake Stringer has kicked six goals, a careerhigh. His previous best was five goals v Essendon in round 18, 2014. The Crows lead hitouts 3720, hitouts-to-advantage 15-5 and clearances 28-26, but they have been outscored from stoppages 2.3 (15) to 5.3 (33). Adelaide Crows InterchangeSam Jacobs replaces Nathan Van Berlo due to the blood rule. Crows InterchangeNathan Van Berlo off due to the blood rule. Lukas Webb wins an intercept possession in the Bulldogs' defensive 50 and launches their third goal from turnovers this quarter and their ninth in total. Stewart Crameri wins an intercept possession in the Bulldogs' forward 50 and scores their third goal from turnovers in this zone. Easton Wood grabs an intercept mark in the Bulldogs' attacking midfield and launches their seventh goal from turnovers, all from their forward half. Welcome to Etihad Stadium for the Western Bulldogs v Adelaide Crows Round 4 clash. 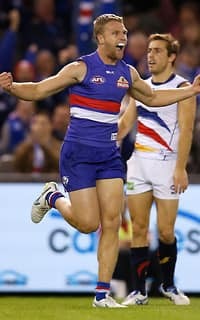 THE WESTERN Bulldogs have stunned Adelaide at Etihad Stadium on Sunday, with exciting forward Jake Stringer kicking a career-best six goals to spearhead a 57-point win. The Bulldogs continued their exciting start under new coach Luke Beveridge and delivered a blueprint of how to break the Crows' forward press in the 18.17 (125) to 10.8 (68) win. 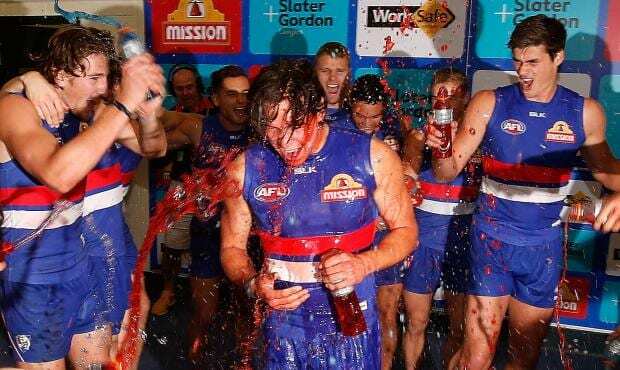 The inspired Bulldogs played a scintillating brand of football that was underpinned by toughness at the coalface and rapid run and clean ball-use on the outside. Their exciting style meant Adelaide was never able to set up its press and lock the ball in its forward half as it had done so effectively in its 3-0 start to the season. 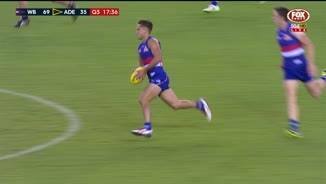 Stringer was the star for the Bulldogs, booting six goals in the first three quarters before being substituted out of the game with hamstring tightness. 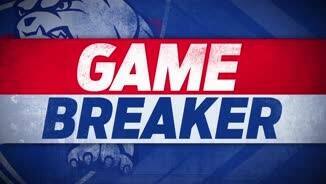 The powerful 21-year-old was at his best in the third quarter, booting three goals as the Bulldogs turned a 35-point lead into a match-winning 75-point break at the last change. He crumbed a loose ball and snapped accurately, baulked around opponent Kyle Hartigan and converted on the run, and then beat the Crows' defenders in transition to run into an open goal for his sixth. Beveridge was full of praise for Stringer but reluctant to compare him to anyone after earlier this year saying young star Marcus Bontempelli was in the mould of Carlton champion Athony Koutoufides. "I'll let you make the comparisons because I don't want to get into trouble with any of the opposition supporters … the Carton supporters shot me down," Beveridge said. "He's a powerful kid and he's quick. He's very good one-on-one and he's a difficult forward to match up on. "In the end we needed to manage him and take him off, he was just a little bit tight in the hamstring but he'll be fine." The Crows, who had used the ball so poorly for three quarters, kicked four of six goals in the final term to trim the margin back in their first loss for the season, which knocked them from the top of the ladder. As well as Stringer, the Crows had no answer for veteran Bulldog Robert Murphy, who starred across half-back with 25 possessions and 17 handball receives. Midfielders Lin Jong (21 disposals and two goals), Jack Macrae (28 and seven tackles) and Liam Picken (29 and six inside 50s) were all outstanding, getting on top of their opponents despite the Crows' clearance advantage (42-35). Key defender Michael Talia, meanwhile, kept Adelaide captain Taylor Walker to just one goal and nine possessions, while Koby Stevens had the better of Rory Sloane early, keeping the in-form midfiedler to just two touches in the first quarter. The Bulldogs were on fire from the first bounce, kicking seven of the first eight goals to open up a 40-point lead under the Etihad Stadium roof. Their fast rebound football consistently left the Crows looking at a clean pair of heels, but their hardness at stoppages was equally important. With the Bulldogs holding a 44-point lead late in the second quarter, Adelaide kicked back-to-back goals to trim the margin to 35 point at the main break and breath some life into the match. But Stringer's brilliance at the start of the third quarter shut the door and handed Phil Walsh his first loss as Adelaide coach. 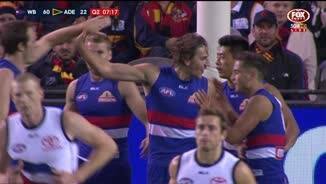 Perhaps most damning for the Crows, they were out-tackled (51-69) despite the Bulldogs having more of the ball (401-364). 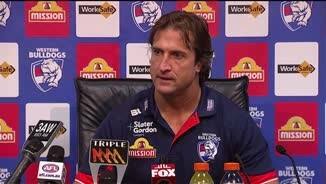 "The Bulldogs were really good, I don't want to take anything away from them," Walsh said. "I thought they pressured us, forced us into turnover and forced us into handball, so I was really impressed with them. "But I was disappointed for our fans who made the effort to come over and we served that up. Not good enough." The Crows have seven days to prepare for the Showdown against Port Adelaide, while the Bulldogs travel to the SCG to face the Sydney Swans on Saturday.